In 2017 I, Sophie Smith, decided I would do something adventurous and signed up to volunteer in Romania providing NGO support. As part of my volunteering experience I chose to participate in the orientation week offered by Care2Travel and I was not disappointed. I got to see some of the beautiful sights Harghita county has to offer and meet some truly great people. I would definitely recommend partaking in the orientation week if you are interested in learning about the history, culture, and language of Harghita county. If you are unsure of what to expect during the orientation week or are wondering what’s included then hopefully some information about my experience will answer some of your questions. An intensive language lesson is included in the orientation week and my first lesson was on Monday. These lessons are so much fun and Hungarian is a really interesting albeit challenging language to learn. At first I was really confused as to why I was learning Hungarian in Romania but once the history was explained it all made sense. Plus it’s pretty cool being in such a bilingual area and it’s really interesting how most of the signs are in both Romanian and Hungarian. Barni, the language teacher, was really nice and extremely patient (also if you ask very nicely he can teach you some funny phrases and tongue twisters). The language lessons are a great way to settle yourself into the area and makes communicating with locals a lot less stressful. Tuesday was when the real fun began. I was picked up at the accommodation at 9:00am by my tour guide László. I was very lucky to have László as my tour guide as he was really lovely and very informative. He could answer just about any question that I had (and trust me I had quite a few). Our first stop for the day was the beautiful old fortified church in Csikkarcfalva. The church was built in the 15th Century but was completely renovated in 2012. It was so beautiful and offered an amazing view of the village. I was also fortunate enough to meet with the priest, who was so lovely and very friendly. He was very interested in hearing about Australia and why I chose to come to Romania. The village itself was also really interesting as I saw so many traditional horse and carts, which are still commonly used today by farmers throughout Romania. After saying goodbye to the priest we made our way to the Red Lake. The Red Lake was so interesting as it was created after a huge landslide and you can still see the stumps of old trees that were swept away in the flood. There was not much for me to do there as it was winter and the lake wasn’t quite frozen enough for ice-skating but during the summer there is plenty to do, including boat rides and hiking. There is a hike through the mountains of the Bicaz Canyon included in the summer orientation week for those who are able. For me it was to snowy to go hiking but the drive down the canyon was still absolutely incredible. On the way down we passed through, what the locals call, Hell’s gate then Hell’s porch, and then finally Hell’s throat. The mountains were so impressive and absolutely massive. After our drive through the mountains we stopped and had a traditional Hungarian lunch at a beautiful old bed and breakfast. We had a delicious vegetable soup followed by Székely káposzta (Sekler cabbage). On the journey home we stopped off in the small village of Szárhegy to see the Franciscan monastery and old castle there. Once a year there is an art festival held at the monastery and artists from all over the world come and create together. Often the artworks, particularly the sculptures, are donated to the village and you can see them at the monastery and in the village park. In summer there is no time to see the Szárhegy because of the hike in the mountains but if you have enough free time I would definitely recommend at least a drive through. Once again I met my tour guide László at the volunteer accommodation at 9:00am but instead of stopping off at an old church before heading to the main attraction we went and saw the natural mineral water springs in Homorod. Homorod was a beautiful little ski town built around the natural springs. I was lucky enough to try some of the water and it tasted… interesting. It is definitely an acquired taste but it is very good for you and is full of iron. After a short stop at the springs we made our way to the Praid (Parajd in Hungarian) Salt Mines. The mines are hundreds of years old and are still operational today. In order to get there you have to catch a bus that takes you through a tunnel to the main entrance. Once you get through the gate, there is a 200 stair descent into a giant salt cave. I have to say I was very surprised once I got to the salt mines as there are cafes, playgrounds, chemists, and even a church. There was also a small museum that provided some information on the history of the mines, which was really interesting. My favourite part however was the old mine shaft. It was really impressive and it’s hard to believe that hundreds of years ago people used to work down there. It was absolutely incredible. After the salt mine we visited the town of Szovata to see the salt block and the Medvetó (Bear Lake). The Bear Lake is Europe’s largest heliothermal lake and gets its name from looking like an outstretched bear skin. In the summer it is a very popular swimming destination and is home to some interesting wildlife, the most famous of which is the stork. The salt block was also very interesting and had many intriguing patterns. On our way home we stopped in the small village of Korund where we met with some potters who were kind enough to show me their workshop. It was fascinating seeing how all the ceramic products were made and the family was so lovely and talkative. They also had a cute little puppy who sat with them in the workshop. Their shop was closed when we visited as it was winter and there were not a lot of tourists however if you are interested you can buy their handmade vases and plates. They are absolutely beautiful and make fantastic presents to take home for family and friends. Thursday was my last day meeting with László at 9:00am. Our first stop was the village Máréfalva to see all the old Székely gates. Nearly every house in this little village has a Székely gate and there is a council program that encourages and helps people to maintain their gates. T​hey are intricately decorated and are quite spectacular to see. After Máréfalva we went to an old Saxon city, Sighisoara. Despite being a major German speaking community a few hundred years ago, today there are very few Saxons still living in the city. It is, however, a very popular city for German tourists and it is quite common to see many signs in German. Our first tourist attraction was the old clock tower and museum. The museum is very interesting with a collection of old building tools and information about guilds that were introduced by the Saxon communities in Romania. The view from the clock tower was incredible. You could see the entire city from there and there were even signs pointing to other famous cities that would tell you approximately how far away the city was. I was particularly excited when I found Sydney. Following the museum and clock tower we climbed an old covered staircase, which lead to a small high school and a church with a Saxon cemetery. I couldn’t imagine having to climb those stairs everyday to get to school. It would definitely keep you super fit. After a quick look around the high school and the church we slowly made our way through the old city. There were many interesting buildings and statues, I even found a statue of Vlad the Impaler. There are also many different towers, each representing a specific guild. There was a schneiderturm (tailor’s tower) and even a tower for the black smiths. All of the buildings were painted in bright colours and there was a great view of the city from the old fortification wall. After a satisfying lunch in a gorgeous little restaurant we made our way home. On our way we made a quick stop at an old Saxon church in Saschiz. During the summer orientation week, volunteers are usually taken to see the Jesus statue but it requires a small hike and the weather was a little to cold and snowy for us to make it. So we went to see the church instead. It was a very beautiful church but when we got there it was closed for restoration work. Despite the bit of bad luck at the end of the day, overall my day in Sighisoara was so much fun. I will definitely endeavour to come back and visit during summer. On the final day of my orientation week I had one last language lesson with Barni. It was nice to learn more Hungarian after being able to practice what I had learnt during my travels through Harghita county. Barni was once again super patient with me and was even kind enough to teach me a little bit of Romanian. The lessons were a great way to finish off a busy week and once again made communicating with locals less daunting than it already was. I would definitely recommend participating in the orientation week if you are thinking of doing so. It is a great way to get a feel for the county before you start your volunteer work and you will have so many great experiences to write home about. If I had the chance to do it all over again I would do so in a heart beat. 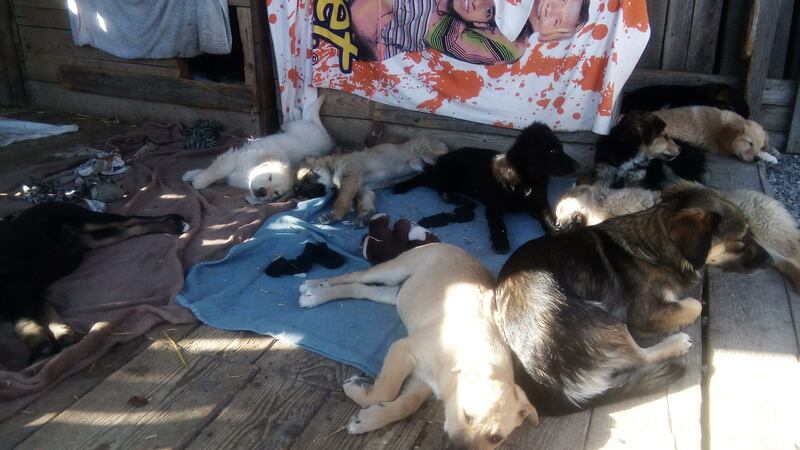 A short time ago I had the opportunity of volunteering at the Care2Travel organization (www.care2travel.org) in the project of Animal Care, during that time I was working closely with a local animal shelter called Pro Animalia Shelter in aiding puppies to be put up for adoption. The shelter helps care for dogs, young and old, and tries to ensure that they reach good homes for a better life through adoption centers primarily in Germany to ensure that they get the best chance had to have a loving home, raising awareness to the current stray dog problem that plagues Romania. My volunteer program with Care2Travel was located in Miercurea Ciuc and just a forty minute walk from the town, although in harsh weather conditions the volunteer coordinators always offered to drive me down to the placement. My goal was to try and gain the trust of the puppies and dogs who often didn’t use to human contact and try to get them ready for a life with a loving family. Each day I had three kennels to spend time at, it is recommended that volunteers spend a minimum of fifteen minutes at each kennel, although I found myself staying there for at least thirty to forty-five minutes. As often the staff and workers are busy with their own jobs of upkeep and maintaining the grounds I went about doing my job without bothering them and at the end always tried to ask around to see if there was any help I could do before returning back to my accommodation. The shelter had a bathroom for use and a room where volunteers could warm up during the colder months or sit down for a break with a tea or coffee. Typically I would arrive at 10:00a.m in the morning, on the first day I was given a brief introduction and orientation to the grounds and was shown which kennels I could enter and which I could not. Although I was the only volunteer working at the shelter and therefore didn’t spend much time interacting with other people while I was there, I never felt out of place or lost. I spent three hours each day in the company of dogs, which was some of the best time I spent on the trip! It definitely didn’t feel like I was doing a lot in the beginning, I mean what kind of work involves playing with puppies for three hours a day? But then I realized something, the shy puppies when I started working there who originally wouldn’t let me pat them, let alone go near them soon were sitting by me and wanted attention. It was eye-opening to realize that without my presence there, it was a real possibility that these puppies, who were shy and afraid of humans, would grow up without a family and stay at the shelter until they were old and unable to be adopted out. It’s impossible to ask that the people who work there day after day give this much time to the dogs, though they always tried to find time in their day to play with them, so volunteers become invaluable. 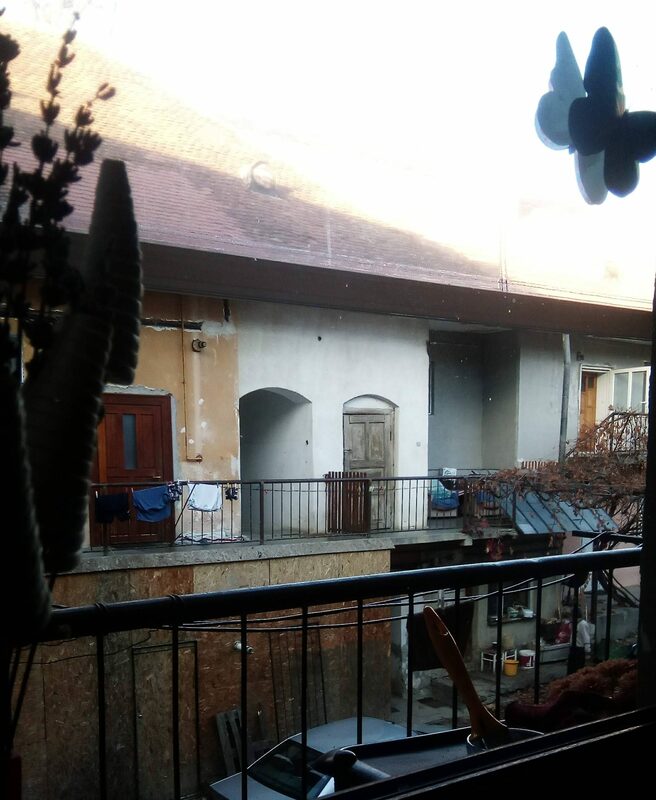 This photo was taken from the volunteer accommodation and shows a shot from inside the girls house to the outside where right across you can see the boys volunteer house. Housing was provided by the team for up to 15 volunteers for girls and 7 for boys.. Heating was throughout the house and a thermostat is in the house to make sure it is always warm. Our accommodation manager would do shopping every Tuesday and Friday and would generally get whatever we wrote down on a list (besides a few items that were expensive due to being out of season) and if anything went wrong in the house that needed repairs he would sort it out. At the end of every week, we would have accommodations meetings to voice any concerns or issues but generally, we just talked with each other. In fact, our coordinators organized two English Clubs that both volunteers and locals were welcomed to come to during the week, we would discuss a range of topics and see lectures from people, during my stay we saw a lecture by Philip G. Zimbardo, which was paid for by the volunteer coordinator. They are now trying to expand the ethical tourism sector of their organization and provide job opportunities for locals by allowing them to conduct tours and show their culture at the same time. I paid for my volunteer program, for the two weeks I stayed I paid $520 USD. If you are looking to volunteer and help out, I’d definitely recommend you volunteer with Care2Travel and their program for Animal Care and hope to one day myself return to Romania and go back to the shelter again. My name is Jared Richard and I am working with Care2Travel as an NGO Support Volunteer. I was asked to take on an additional task during the final week of my four week stay, which has proved to be a very fulfilling and worthwhile experience. In the small village of Csíkszentmárton, just 17km southeast of Csíkszereda (Miercurea Ciuc), is a foundation by the name of Serviciului Internaţional de Salvarea Copiilor (The International Child Rescue Service). There, children with disabilities are brought to be cared for by trained professionals who help develop their physical and intellectual capacities. Because this village is rather isolated however, the employees seldom have the opportunity to interact with English speakers, thus diminishing their ability to communicate efficaciously in the language. This is disadvantageous for them, as they intend to expand their foundation so as to broaden their child rehabilitative outreach, but are limited by their insufficient grasp of English. Care2Travel has been working with this foundation for eight years now and recognized their need for English improvement. Seeing as how Care2Travel has willing volunteers at their disposal, we offered to send English teachers to Sânmartin to hold English discussion/classes for the employees twice a week. I was fortunate enough to be one of these volunteers. The employees vary in their level of understanding, but all have a rudimentary comprehension of the language, enough to engage in simple conversation. Volunteers organize basic, one hour long discussion topics so that concepts can be explored while practicing English. The aim is to allow for the employees to use the language in a more practical manner that allows for vocabulary development, sentence structure improvement, grammar supposition, and retention. Volunteers lead the discussion, asking open-ended questions, using a variety of means to prompt participation. In this way, the employees are able to recall words and are given occasion to use them in conversation. Discussion topics should be broad and relevant, but interesting, so that everyone has the opportunity to speak. This is a wonderful opportunity for Care2Travel volunteers to exercise their teaching skills without having to formally teach. What is more important is fostering an environment in which the foundation’s employees are comfortable enough to speak freely, make mistakes to be corrected, and gain confidence in their ability to converse freely in English. They are very grateful to Care2Travel and are excited for the classes to continue so that they can improve their communicative capabilities beyond Harghita County. Summer Camp for over 80(!!) kids ranging in age from 5 to 14. We worked with the local teachers and some local volunteers. The first day started out with a group exercise lead by our fitness expert Mike.The kids did everything from running to burpees to jumping jacks. The kids were then separated into 4 different groups with an equal range of ages and skills. They then went to their classrooms and worked together to create a team flag. Every single person contributed to their flags and the team work was amazing. The big kids also helped some of the younger kids with their drawings! After the flags were created and laminated it was time for some competition! The kids did a variety of games to see whose team would come out on top for that day! After the competition the kids went back to their classrooms with their teams and the wonderful teachers and volunteers (both local and international) to learn some English! Each room was assigned around 20 words to learn and review. The volunteer would write the word on the board in English and the students would then repeat the word, write it down, and then write the Hungarian translation. Every day at camp the students will be learning around the same number of words while reviewing the words from the previous days. At the end of the week the kids will have learned and reviewed around 80 new words! This camp would not have been a reality without the incredible team work of the Care2Travel team, local volunteers, and our international volunteers who have worked hard all summer to set up camps just like this for many different towns around the area. Thank you to all who have helped out in any way to make such a difference for these children! My name is Byan, a 21-year-old travel enthusiastic. They always say the world is a small place and life is short, I tend to disagree, I find joy in travelling and I believe that even 70 years would not be enough to discover the different places and cultures our world is enriched with. I am not a typical person I prefer doing things in a different way, I like having different stories to tell and IVHQ gave me the opportunity to do so. I chose to volunteer in Romania with Care2Travel association, one of the best decisions I have made. The people I met made me feel at home right away, I connected to them easily as we all share one unique thing, we all want to make a change and are willing to act on it. The accommodation was very clean and organized, Norbi, the responsible for taking care of the place, was very nice and a friend with the volunteers. The accommodation was in the main street, everything was within reach which made it easier to spend time and hang out. The first day we met with Peter, the head of the association, Orsi and Boti who work with him. He introduced us to the culture and history of the place and then we had a welcome launch in the accommodation who fellow volunteers helped put together, the food was clean and tasty. We also went on a town tour with two local girls, they showed us the main sites of the place, in addition, we had a Hungarian language lesson where they taught us basic words. My project was NGO, I worked at the office, some of the main things we were asked to do is help introduce the association to more people on social media, research ways to help with the new Gypsies’ program, look for ethical tours in the area…etc. Peter always appreciated the work we did which made us feel important, a part of something big. Volunteering hours were between 9 and 1 and then we would go have launch in a restaurant, but we used to go earlier and finish even later than 1 because we liked the work we did. At nights we would make dinner together, watch a movie, go to a bar or just sit down and have chat. During the week one can do day trips in the area, with its beautiful mountains and magic there is so much to do. I went hiking one day with a local guide, he was very nice and his love to the place added to the joy of the hike, another time I went climbing with a guide and 2 locals, beside the amazing climb and the adrenaline rush, they also took me on a car ride to beautiful views in the area and invited me to Kürtőskalács, a sweet pastry specific to Hungary and Hungarian-speaking regions, it was so good I had to take the recipe. In the weekends there is enough time to go discover other towns, visit castles or go camping. 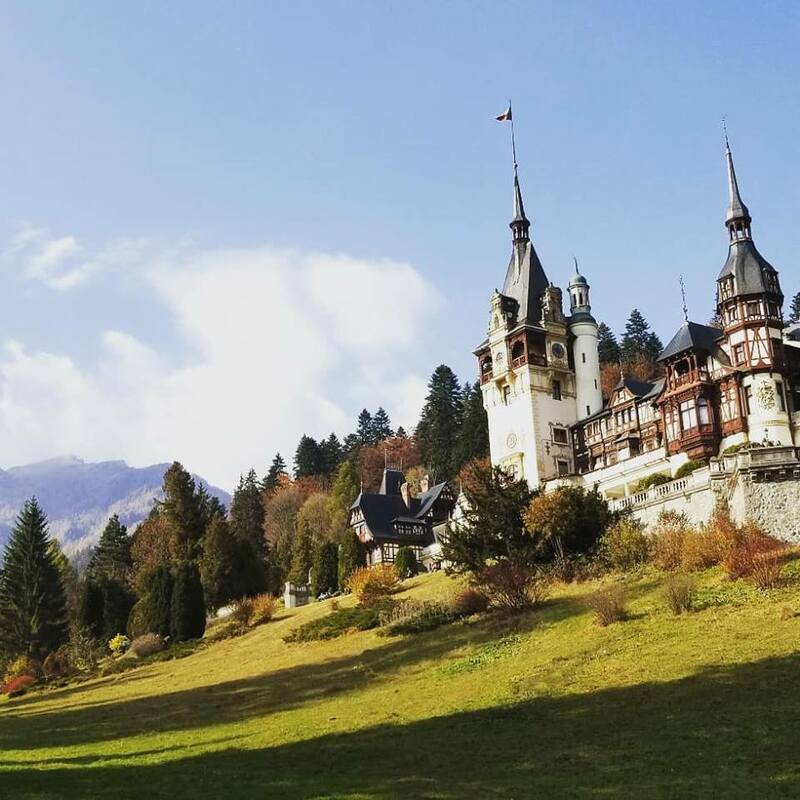 The adventure I had in Romania and specially in Transylvania is not over yet, the magic of the place is so big I did not finish discovering it yet. For whoever is reading this I encourage you to volunteer in this extraordinary place with these wonderful people, and when you go home I am sure that the best stories you can tell will be about this adventure. Telling a group of Hungarian students that one of the traditional ways of cooking food in your country is to bury it in a pit with coals is an excellent way to grab their attention. Getting them to talk, that’s the challenge when you’re new. They’re all curious and lively, sometimes alarmingly so, but a little on the shy side when it comes to speaking English. Telling them about something odd or unusual is a great way to break the ice. I learnt this on my first day of teaching. Bankfalva is a village school outside of Csíkszereda. I was teaching a wide range of ages, from 6 – 14 years old, which also meant a wide range of English abilities. The young ones are predictably cute, the juniors the liveliest of the lot (I always prepared myself with more caffeine on those days) and the seniors, not surprisingly, more capable of understanding me. The first lesson for each class was an introduction to me and my home country of New Zealand, and all I can say is be prepared for random questions! After that I asked the teachers I worked with what was happening with the next lesson and prepared in the afternoon for the next day. Daily routines, weather, time and the five senses were some of the topics we covered, which gave me a lot of scope for material. The teachers I worked with were really supportive, making sure that I had what I needed and was comfortable in the class. I really enjoyed using games to teach. They are a great way to cement new vocabulary or to revise words already taught. If you can add an element of competition to it even better. One particular relay game involved a lot of running across the classroom, and on reflection probably should have been done outside J The kids got into it so much it’s a miracle they didn’t bash heads or trip over the furniture. My main aim was to get the kids to speak English, even little bits and pieces. It helped to say a few words in Hungarian. If I made a fool of myself, they’d be more willing to try my language. The results were a mash up of surprise, delight, and hilarity. Accompanied by dubious drawings, a group of students and I spent some time thinking the other person put cockroaches on their pizza before eventually being saved by the sometimes helpful Google translate. So, lessons learned and things discovered. Learn about the students and their world and they will get involved. Classes are run at a higher volume and with more interruptions than often seen in other countries so be prepared to be active. Check with your support teachers about what they are doing, it will make your prep work a lot easier. Lastly, enjoy the time. If you enjoy it, they’ll enjoy it, and it won’t even feel like work. And when you’re not working? Walking, touring and trying all the local goodness. There’s a lot see and plenty that I packed in to the three weeks I was here. 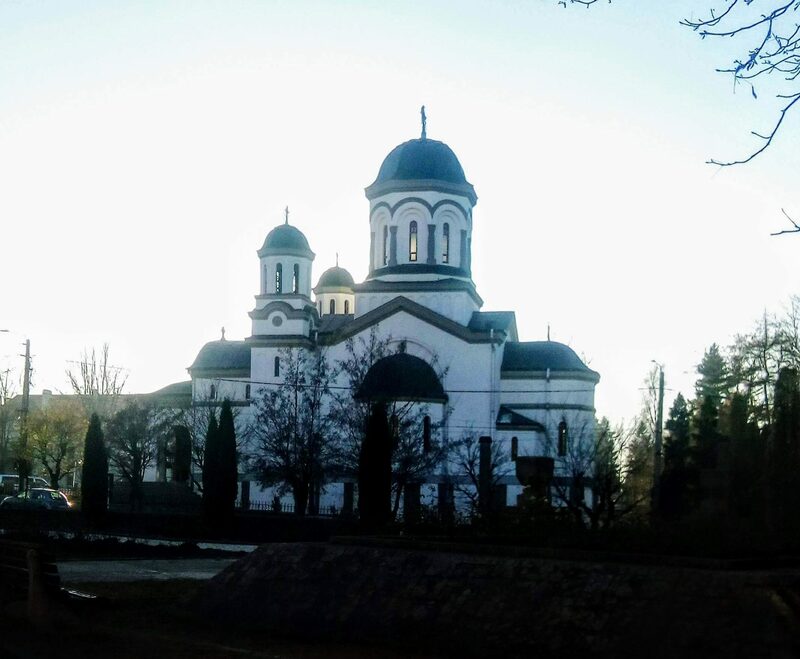 Road tripping with the other volunteers to see the stunning Peles Castle, Rasnov Citadel, the medieval town of Sighisoara, Fagaras and Prejmer. A day trip to Brasov was packed with sightseeing, a bit of shopping and taking advantage of the many outdoor dining areas which sprawl all over the pavement. I was also lucky enough to be in Csikszereda when the annual Pentecost pilgrimage happened and hundreds of thousands of people gathered in the neighbouring village of Csiksomlyo. Walking with them, hearing the songs and bells and seeing everyone gather on the hill at Csiksomlyo was definitely a highlight. “I volunteered in Romania from February 13th to March 10th 2018. I worked in the teaching program. My placement was located in a small village called Bankfalva which was a twenty minute drive from the volunteer accommodation. My sister volunteered with me. The organization allowed for us to be able to work together in the same placement which was very important to the two of us. We worked with children in kindergarten to grade seven. The teachers that we worked with were very supportive of us. They were very clear with what they wanted us to do. The children at the school were very enthusiastic. Their attitude towards us made it easy for us to be able to enjoy our time at the school. The organization provided us with an abundance of wonderful food over the course of our stay. The accommodation that the organization provided for us to stay at was very comfortable and it allowed us to be able to meet people from around the world. We were able to create friendships with these people and learn about their culture along with the Hungarian culture that we were immersed in. I loved the time that I spent in Csikszereda and I am positive that three weeks was not enough time to spend there. Though I am grateful for the time I had there and all of the memories that I made. I could not have asked for a better placement. The school that we were in was wonderful. All of the kids were so sweet to us. The teachers were extremely supportive of us. Everyone at the school welcomed us with warm hearts and we became part of the community. Our attitude toward the situation we were in helped us. We were happy and upbeat which was passed onto the kids we worked with and allowed us to get the most out of our placement. A positive attitude is always a must. Each volunteer position will vary. Especially if you are working in the education program. Each teacher that you work with will expect something different of you, even if they are at the same school. It is important that you are able to adapt to the needs of each of the teachers. They will tell you exactly what they would like you to do you just need to be able to work on your feet and help them. That is what you are there to do. Do not be afraid to ask questions. The teacher that you are working with and the in country team will be more than happy to help you. You are better of to ask than to struggle. The accommodation was a comfortable place to live. It was overwhelming when there were so many people living there at once, but once some of them left it was a much better experience. The accommodation staff were wonderful. They were always there to help us when we needed them and to solve any problem that came up. The food was wonderful. We loved the restaurant where we ate our lunches. The people there were friendly and the food was delicious. The rest of the meals we cooked for ourselves which we enjoyed because we love to cook. And we always had plenty of groceries provided for us to use and a good variety.